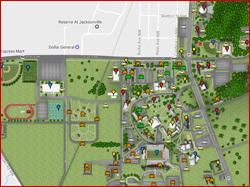 Jacksonville State University Police Department has the authority to promulgate and enforce rules and regulations for the operation and parking of motor vehicles on campus. The responsibility of obtaining knowledge of the parking and traffic regulations rests with the motor vehicle operator. These rules and regulations are subject to enforcement on a year-round basis regardless of whether or not school is in session. 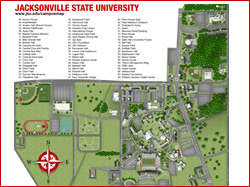 These regulations are provided and enforced to ensure the safety of drivers, pedestrians and property, as well as provide adequate parking facilities for all who drive a vehicle on the Jacksonville State University campus. A parking and traffic plan can be successful only when all faculty, staff, students, non-JSU personnel, and visitors abide by the governing regulations. Each visitor who operates a vehicle on campus must obtain a visitor parking pass issued by the University Police Department or the building manager or their alternate for the building you are visiting. Visitor passes are available free of charge to visitors and must be displayed on the front dash passenger side. Visitors may park in any legal parking space on Campus except for reserved parking spaces, unmarked white curbs or other identifying methods. There is no parking on Trustee Circle or at the GX Bus Stop. State parking laws such as yellow curbs, handicap parking, etc. are enforced at all times. Failure to obtain a visitor parking permit may result in parking citations. Visitor permits are available 24 hours a day 7 days a week at UPD. Visitor permits are valid for maximum of 1 day. Current Tag Receipt or Copy. This must be presented when picking up parking permit at UPD. Changes to information should be reported to UPD for updating registration data. Current faculty, staff, and students are prohibited from operating a vehicle utilizing a visitor pass. Persons who repeatedly violate parking rules and regulations or misuse a pass or decal are subject to having their privileges revoked and may face disciplinary and/or criminal actions. Questions concerning the Jacksonville State University parking system should be directed to the University Police Department at 256-782-8888. The University Police Department is located at Salls Hall, corner of Forney Avenue NW and Cole Drive, across from Campus Inn Apartments.